A couple of months ago, Yahoo debuted a new messaging app called Squirrel and offered it as an invite only beta for anyone interested. Now the app has been released as Yahoo Together and is available for download on iOS and Android. Yahoo Together replaces Yahoo Messenger, which was retired by the company earlier this year. In fact it comes from the same team behind Yahoo Messenger and uses your Yahoo account. You can invite people to your group who are not signed up by using a unique code that the invitee can enter upon signing in. The interface is very similar to one of its competitors in the market, Slack. 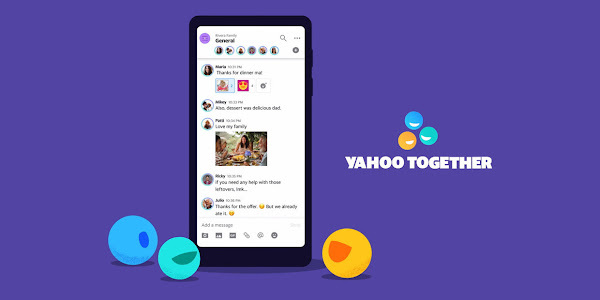 Essentially, Yahoo Together is a group messaging app that makes it easy to get organized and make plans with features like reminders, custom reactions and a mute function. Topics — Keep your group conversations ultra-organized with topics. Secret topics — Use secret topics like Mom’s Birthday Surprise for private conversations. Reminders — Make plans and don’t flake out. Automatically set group reminders by tapping a message and hitting remind. Custom reactions — Make inside jokes official. Use any image or selfie to design custom reactions. Mute — Turn off notifications for topics that are a snore. Blasts — Hit blast to make sure everyone in your group sees important messages. Attachments — Share photos, documents or links. Easily find them later all in one place. Activity view — Never miss an important message. Know when you are mentioned, all in one view. Privacy — Invite your group with a link. No need to share your contacts with us. While we'd like to see features like voice calling on Yahoo Together, for now it will have to make a name for itself with what it offers and hope it doesn't suffer the same fate as its predecessor. Will you be using Yahoo Together ?